Police in Charlotte, North Carolina, said they gave Keith Lamont Scott "loud, clear, verbal commands" to not exit his vehicle and drop his weapon before an officer fatally shot him on Tuesday. But it's still unclear whether he pointed the gun at the officers, according to Charlotte-Mecklenburg Police Department Chief Kerr Putney. Scott's family has said he was not armed and was holding a book while waiting for his son to be dropped off from school. Putney told reporters at a news conference today that Scott was holding a handgun, which investigators recovered from the scene, and posed a threat because he was not obeying police orders. "The officers gave loud, clear, verbal commands, which were also heard by many of the witnesses," Putney said. "Mr. Scott exited his vehicle armed with a handgun as the officers continued to yell at him to drop it." An officer subsequently fired his weapon, striking Scott, who police said was treated immediately and later pronounced dead. An investigation into Scott's death is ongoing. "I don't know that he definitively pointed the weapon specifically towards an officer," Putney told reporters. "I can tell you from the facts that the story is a little bit different as to how it's been portrayed so far, especially through social media." 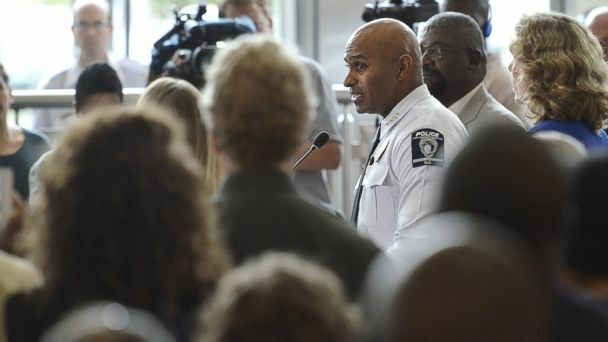 Police have identified the officer involved in the shooting as Brentley Vinson, who has been employed with the Charlotte-Mecklenburg Police Department since July 21, 2014, and is currently assigned to the metro division. He has been placed on paid administrative leave as the investigation continues, according to Putney. Vinson was not wearing a body camera at the time, but the other officers who responded to the incident were. The footage will not be released until the investigation is complete, Putney said. The incident began around 4 p.m. Tuesday, when officers arrived at an apartment complex in Charlotte, searching for a suspect who had an outstanding warrant, according to a police statement. Police said Scott, 43, was not the suspect officers had sought. Cellphone video shows the scene after Scott was shot. Several emergency responders tended to his body and lifted him onto a stretcher. Violent protests rocked Charlotte after Scott's death. At least 16 police officers were injured while trying to quell the demonstrators, and multiple police vehicles were damaged, according to Putney. The protesters blocked northbound and southbound lanes on a portion of I-85 in Charlotte. Some individuals looted a tractor-trailer and set fire to its contents. Officers in riot gear gave multiple orders for the people to disperse, and when they didn't, police deployed tear gas. One person has been arrested, Putney said. During the news conference today, Charlotte Mayor Jennifer Roberts expressed concern for Scott's family and the officers injured during the protests. She also called for peace and patience. "This is a difficult situation for everyone involved," she told reporters. "Our top priority is for Charlotte to remain a safe community for everyone who lives and visits here." North Carolina Gov. Pat McCrory said in a statement that it's "very important" that his office work with city officials and the police chief "to solve a very difficult issue and to bring peace and resolution." "My prayers are with the Scott family and also our law enforcement, especially the 16 police officers who were injured last night," he said. "As governor, I'm going to do everything I can to support the entire city leadership in their effort to resolve this situation." The ACLU called on the Charlotte-Mecklenburg Police Department to release video of the shooting "in the interest of transparency and accountability," noting that a new North Carolina law restricting the release of such recordings does not take effect until Oct. 1. The law, HB 972, says footage from police body or dashboard cameras may not be released publicly without a court order. "We join the people in Charlotte and across the nation in sending our deepest condolences to Mr. Scott's family," said Karen Anderson, the executive director of the North Carolina ACLU. "We demand a full investigation into why yet another black person in the United States has died at the hands of a police officer. The public and Mr. Scott's family deserve answers." In response to the fatal shooting, B.J. Murphy, a religious leader, called for an independent investigation into the incident and "an economic boycott" of the city. "Since black lives do not matter for this city, then our black dollars shouldn't matter," Murphy said at a press conference with other black leaders today. "We're tired of being killed and nobody saying nothing." He continued, "I don't want to offend nobody. But hell, man - man, we ain't got nothing to lose."